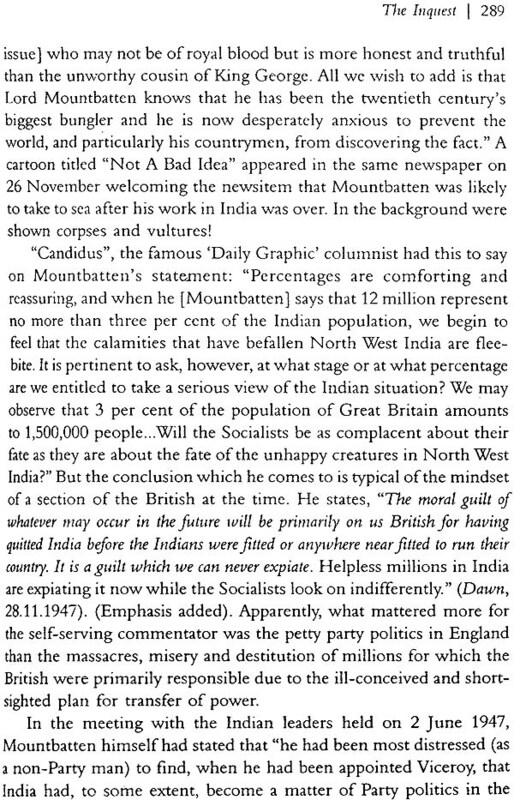 The partition of India was a traumatic event. 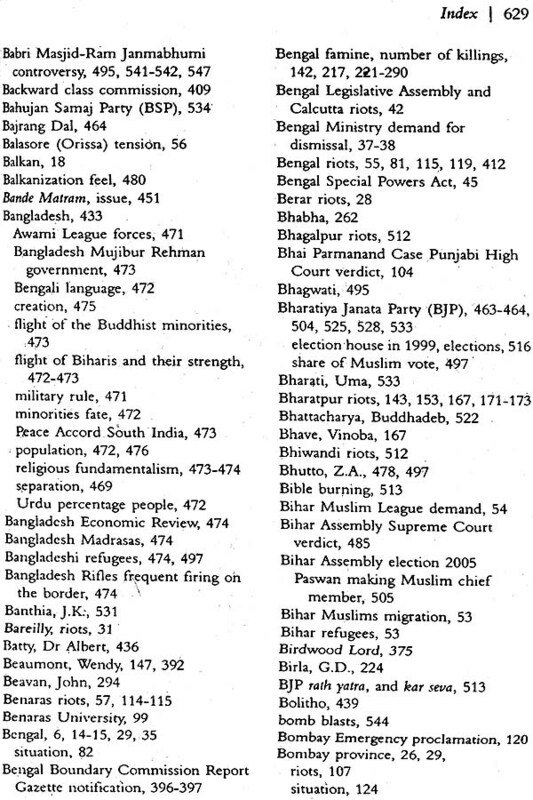 Apart from destroying the unity of India, the two-nation theory created a divide between the Muslims and non-Muslims which has not been easy to bridge. But, more important was its tremendous human cost-loss of about a million lives and uprooting of nearly eighteen million people. This holocaust, which Nehru described as a man-made Greek tragedy, is the focus of this book. Based on extensive and in-depth research, it sheds new light on several important issues. The book surveys the critical eighteen-month period preceding the transfer of power which saw widespread communal hatred and violence. 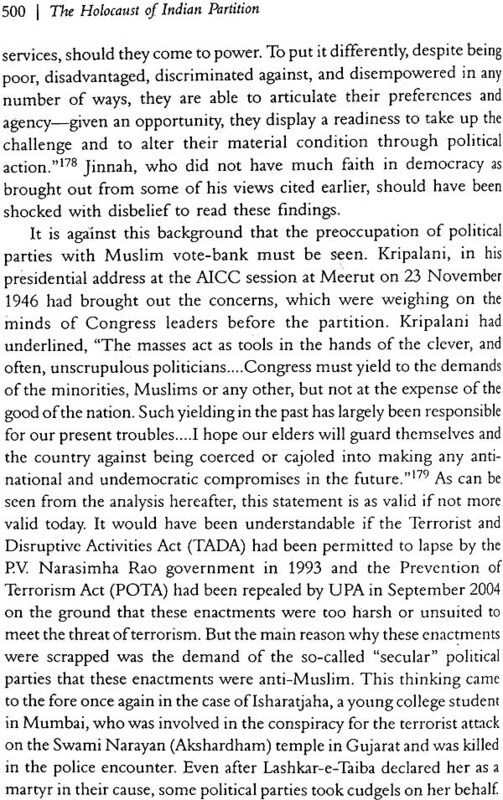 The poison of communalism had seeped so deep that it should have been evident to anyone that transfer of power was not going to be peaceful. But, the British and the leaders of the two would-be dominions-India and Pakistan-failed to see this writing on the wall. The book vividly brings out the holocaust, makes a clinical and thorough inquest, and concludes that, with foresight and planning, its extent and severity could have been reduced substantially. Analysis of such a monumental tragedy inevitably leads to a critical appraisal of the role played by the authors of the tragedy, and the actors who played a part in it-on stage, backstage and in the wings. 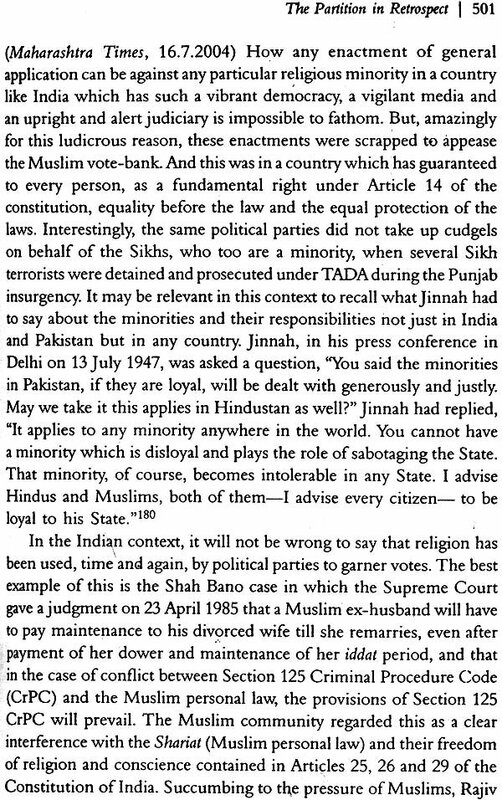 The book argues that Nehru and Patel must have been aware of the seriousness of Jinnah's illness and still pressed for partition. India, which is better off with partition, should be eternally indebted to them for their farsightedness, political courage and statesmanship. 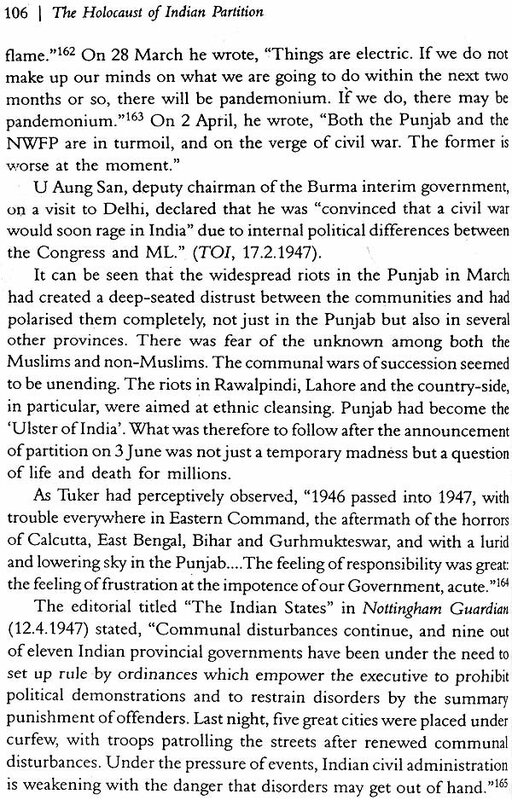 United India would have been unliveable, ungovernable, unsurvivable. With its wide canvas, this fascinating and thought-provoking book is a must read. Madhav Godbole (b. 1936) has a M.A. in development economics and M.A. and PhD in economics (University of Bombay). He joined the Indian Administrative Service in 1959 and resigned as Union Home Secretary. He has been secretary, Urban Development, and secretary, Petroleum and Natural Gas in Government of India, Principle Finance secretary, and chairman, Maharashtra State Electricity Board in Government of Maharashtra. He worked in the Asian Development Bank, Manila, Philoppines, from 1980-85. He has written eleven books in English and Marathi. He has co-authored the working paper, A Quest for Good Governance based on his public interest litigation in the Supreme Court. He also writes on current issues in newspapers and reputed journals. After retirement, he worked as chairman of several Committees: state level economic reforms, co-operative sugar factories, Enron Power Project, power Sector reforms, amongst others. He is the recipient of chinmulgund Public administration Award and Dr. M. Visvesvarayya Memorial Lifetime Achievement Award. The machinations, political strategies, confabulations and processes which led to the Partition of India have fascinated me for a long time. 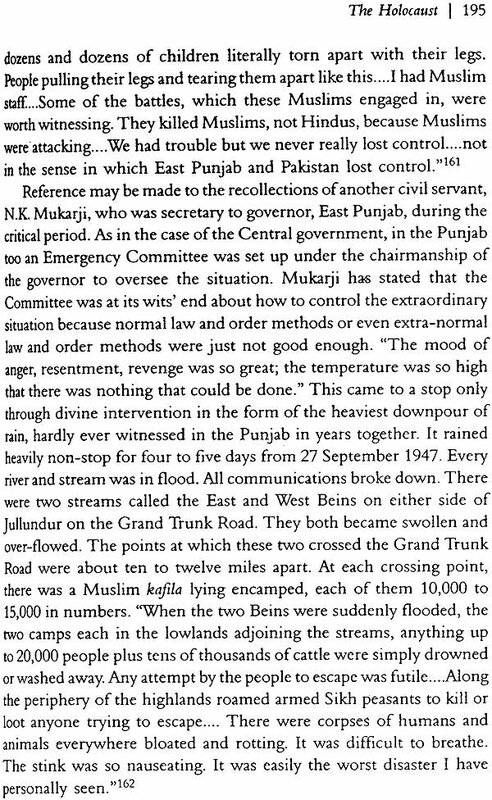 But, more than the partition itself, what captivated me was the colossal human tragedy which was the traumatic and inevitable culmination of the partition. It showed how millions of common, innocent persons, far removed from politics, became mere pawns in the hands of apparently larger-than-life Indian politicians and the British who were in authority, in their games of one-up-manship. After the lapse of nearly six decades, it is time to take an objective, clinical and apolitical view of this horrendous and gruesome chapter in the history of the Indian sub-continent. When most of the main actors in this "manmade Greek tragedy", as Nehru described it, have departed from the scene, an effort must be made to take a more detached view, untainted by narrow preferences, personal and political loyalties, and national and cultural prejudices and biases pertaining to those who wrote the tragedy and directed it. It is also imperative to introspect on the lessons of partition and ponder on the future course of action and the ormidable challenges ahead. It has taken me more than three years to research, reflect on and write this book. It is with a great sense of humility and an acute awareness of my limitations and shortcomings in working on such a large canvas that, with some trepidation, I am placing the book in the hands of the readers. I am thankful to my former colleagues, Satish Chandra, a well- known diplomat, and K.M. Ahmad, who is now a busy attorney in New York, for having spared time, from their busy schedules and numerous other commitments, to go through the manuscript and make valuable suggestions. My wife Sujata and daughter Meera Krishnamurthy have always been diligent readers and critics of all my writings. I am thankful to them for their helpful comments. However, I am alone responsible for any gaps and deficiencies which may have remained. I would like to place on record my grateful thanks to Sir Ratan Tata Trust for part-funding the research for this book and Govinda Rao, director, National Institute of Public Finance and Policy, New Delhi, for administering the research grant through his institute. I am thankful to Jaya Ravindran and A. Roy, archivists in the National Achieves of India, N. Balakrishnan of the Nehru Memorial Museum and Library, Dyaneshwar Bagade of the Arthabodh Institute in Pune, and Dev Raj for their help. I am beholden to Sanjana Roy Choudhury for editing the book so diligently and paying close attention to its flawless production. I must also place on record my grateful thanks to my publisher for bringing out the book so expeditiously. Finally, this book would not have tome to fruition without the support, encouragement and patience of my wife Sujata. I am indebted to her, as always. There are people, in India and abroad, who assert that India got her freedom too cheaply and did not really have to sacrifice much for it. It is unfortunate that this perception has continued all these years in spite of the sacrifices made by millions of people in the freedom struggle which was largely carried out in a peaceful, non-violent manner. 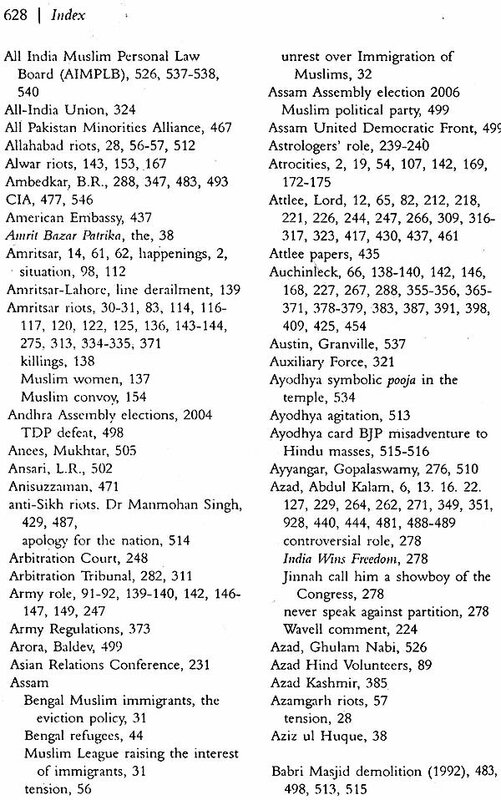 Jawaharlal Nehru himself spent as many as 3,262 days, i.e. nearly nine years in jail. It was on 13 April 1919 that Brigadier General Dyer opened fire on 20,000 unarmed and defenceless men, women and children in Jallianwala Bagh which led to the brutal massacre of thousands. Hundreds of thousands died in communal conflagrations all over the country in the period preceding the partition. Death penalty imposed on valiant freedom fighters, the torture and suffering of freedom fighters in jails not just in India but also in Burma (now Myanmar), and the inhuman conditions in which freedom fighters such as Sawarkar were incarcerated and tormented in the Cellular jail in Andaman have been forgotten by ungrateful people. 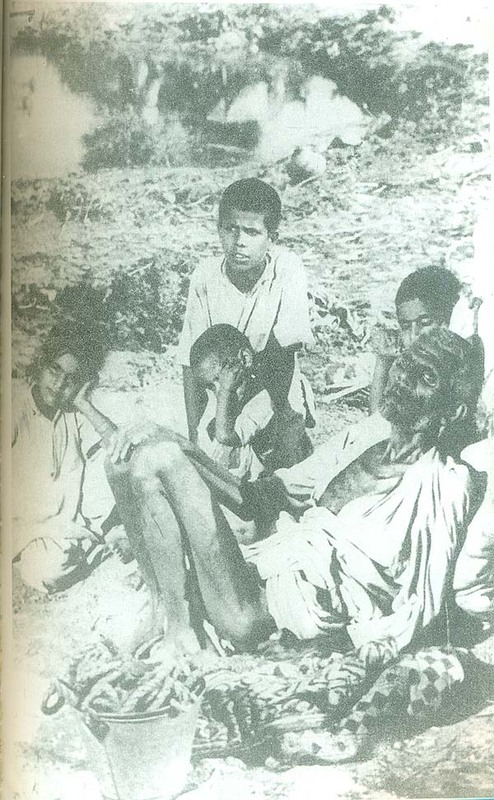 But the biggest price for independence was paid during the partition of India in August 1947 when over a million people died (estimates vary from as low as 200,000 to two million) and nearly eighteen million were uprooted from their homes and hearths and became refugees. 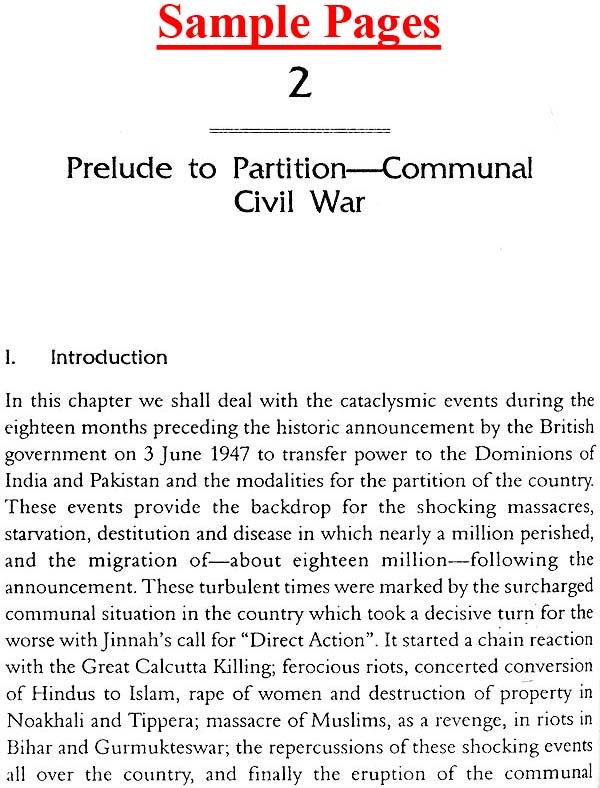 As the well known writer Krishna Sobti, who himself became a refugee, put it so aptly, partition is difficult to forget but is dangerous to remember. The atrocities which accompanied this migration, the largest in human history, were unbelievable. The atrocities against defenceless women and children were particularly shocking. All human values were debased and trampled. There was no difference left between human beings and animals. 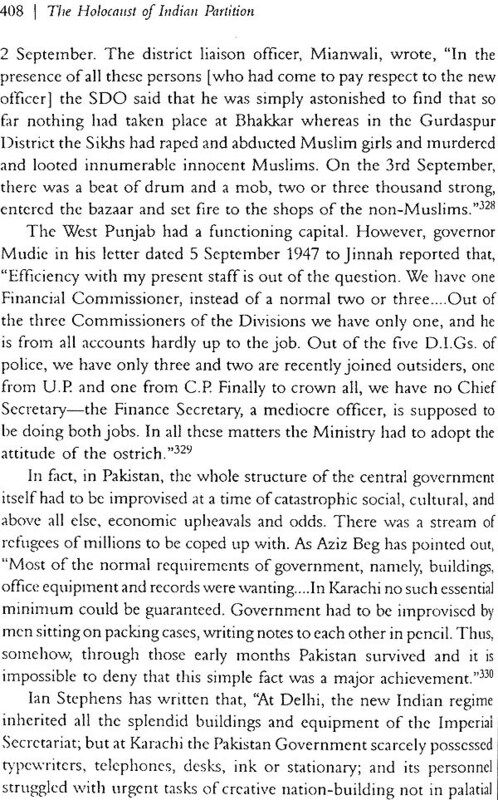 The anger and frustration of the displaced persons was so palpable and frightening that it was sheer wonder that no harm came to Gandhi (even earlier than it did) and Nehru. As Collins and Lapierre have brought out, a wealthy refugee, who had only Rs 500,000 left and felt wiped out and ruined, wanted to donate every pie of that money "to having Nehru and Gandhi killed". On 22 June 1947, even before the partition massacres and large- scale migration had begun, Nehru wrote to Mountbatten regarding happenings in Lahore and Amritsar. Nehru wrote, "Horror succeeds horror and we cannot put a stop to it .... Human beings have an amazing capacity to endure misfortune. They can bear calamity after calamity; but it is very difficult to have to bear something which can apparently be avoided. I do not know if it can be said that what is happening in Lahore is beyond human control. You gave an assurance even before 3rd June and subsequently that any kind of disorder will be put down with vigour. I am afraid we are not honouring that assurance in some places at least, notably in Lahore and Amritsar. Gurgaon also is still more or less a battlefield."? (Emphasis added). 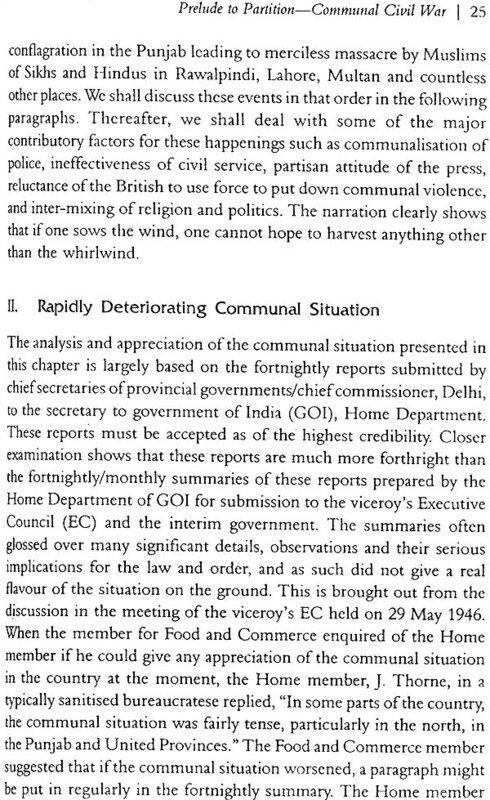 Though impending civil war was the common refrain all over the country and though it figured again and again in official correspondence and assessment, no one has owned responsibility for the monumental carnage and every one, who was involved in the decision-making processes and affairs of the state during the crucial period, has tried to safeguard his position in history by shifting the blame to someone else or to attribute it to reasons beyond the control of anyone and therefore unavoidable. These are the issues which are addressed in this book. 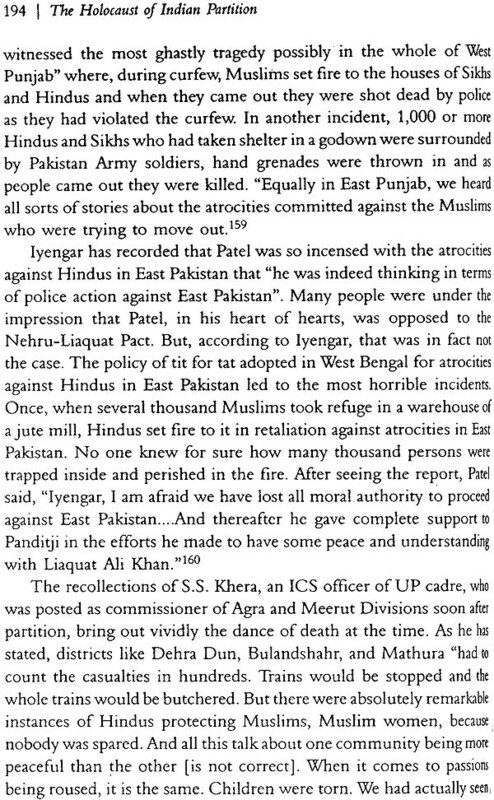 Was the huge human cost paid during the partition unavoidable? Was the strategy for transfer of power flawed? Could the underlying issues have been addressed any differently? The findings in the book are based on research of the primary and secondary sources of data. The primary sources comprised the government records for the relevant period preserved in the National Archives of India (NAI) and made open to public, oral history transcripts, and the invaluable volumes published by the British government titled The Transfer of Power 1942-47 (TOP).4 Mountbatten's extensive interviews given from time to time as also his writings have been another important source, as are the writings of a number of British and Indian officials and others who served in India during the period. 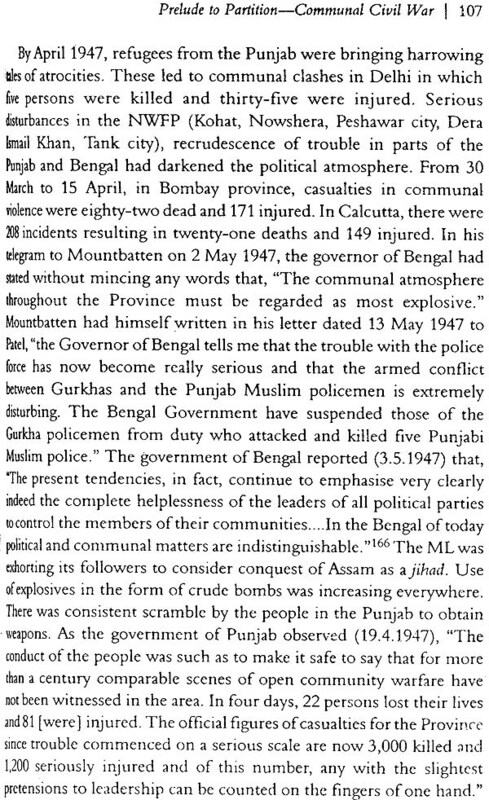 Attention may be invited in this context to the observations made in 1978 by Listowel, who was secretary of state for India in 1947, when the British Cabinet papers of the partition period became available: I do not think that anyone who has tried to follow the accounts published in this country of the transfer of power could fail to be struck by the fact that they have almost all emanated from authors who had earlier served in the government of India, or in the entourage of Lord Mountbatten, or had derived their information from his writings and recollections. 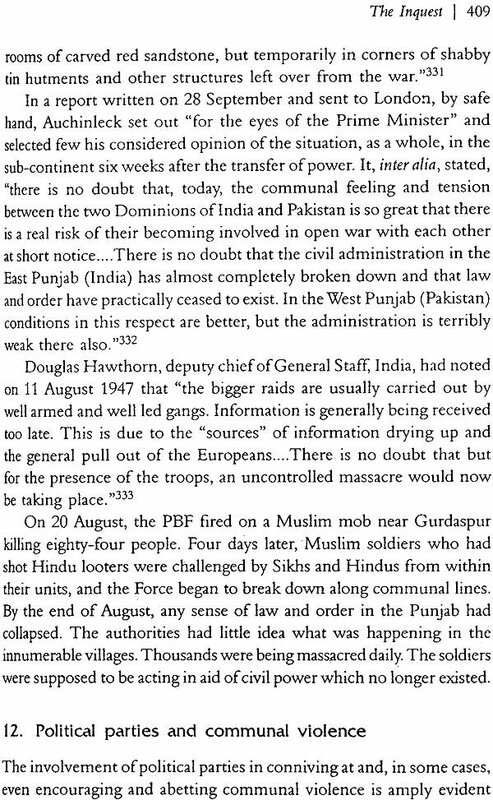 Hugh Tinker has rightly stated, 'We still await a version of the events of 1945-47 which will describe what happened from within the Congress-and within the Muslim League. So far we see everything through British, official eyes."? For example, H.V Hodson, who held the post of constitutional advisor to the viceroy in 1941-42 and was editor of The Sunday Times from 1950 to 1961 has observed in his book The Great Divide, "I am conscious that the sources and the outlook are predominantly British, though Britain was only one party among two or three to the events recorded. 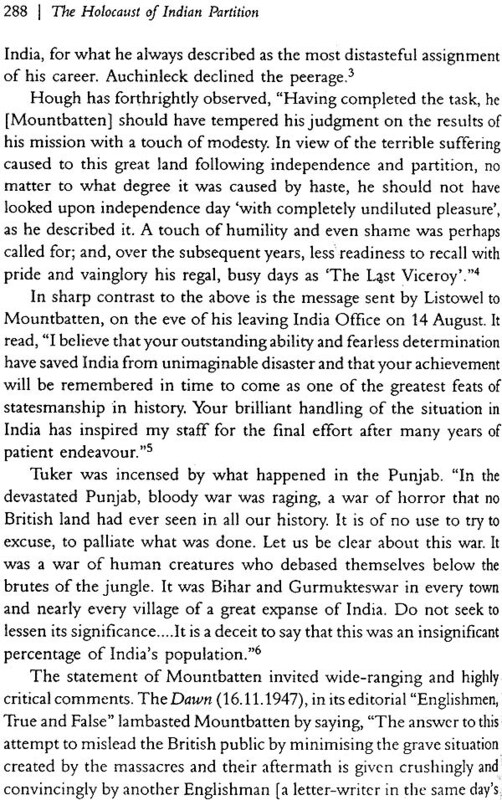 But, I reflect that every historian, however impartial and careful of the truth, as I have tried to be, must have a personal point of view, without which history is anaemic, and my viewpoint cannot but be British; and that only an Indian or a Pakistani could write from the viewpoint of his own people and leaders.'? One can join issues, particularly with the latter part of the statement that only an Indian or a Pakistani could write from the point of view of his own people and leaders. This does not have to be necessarily so. A true seeker of truth should be able to get over narrow national and cultural prejudices. A number of British writers such as Leonard Mosley, Richard Hough and others have not only not praised the role of Mountbatten but have also been critical of him. But, Mountbatten agreed with "every word that Hodson has written" and has quoted him extensively again and again in his correspondence with S. Hashim Raza. Commissioned history has its serious pitfalls. It must not be forgotten that history's tests are harsh and inescapable. As Collins and Lapierre have rightly stated, "History has a way of providing, not answers, but ever more troubling questions."? 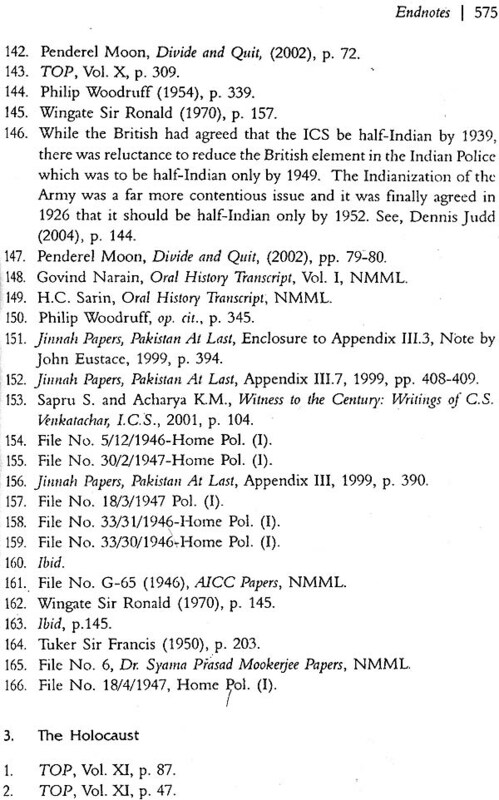 Considerable government records of the period in India have still not been released. The government of India (Gal), which believes in far too much secrecy, even as compared to the British government, has still not transferred considerable record of the period to the NAI. My letters to the Union Home secretary, followed by reminders, in this regard remained unreplied. 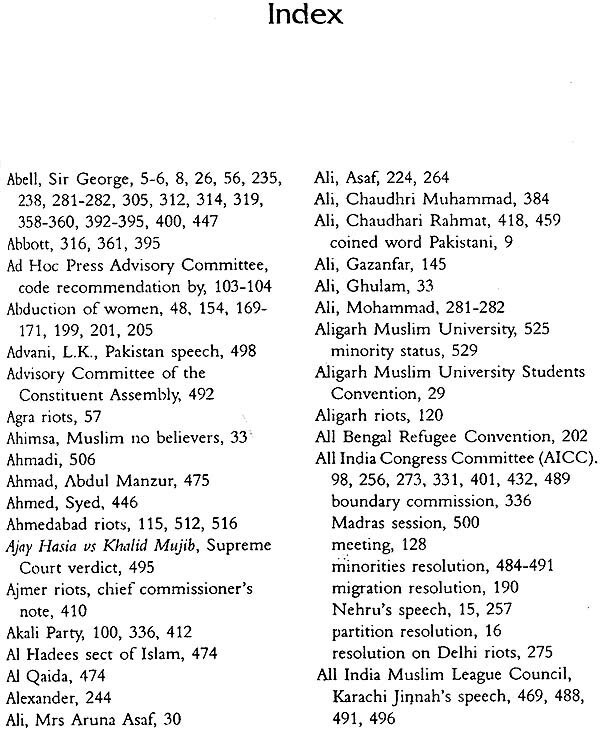 The Index to the Proceedings of the Home Department, Political Section, for the years 1946 and 1947 (which incidentally is marked confidential) contains the list of a large number of files. However, only a few of these have been transferred to NAI. It is not known whether the other files are still in the Ministry of Home Affairs (M HA) or have been destroyed. It is high time their status is made clear. Several files of Home Department and other concerned departments which are preserved in NAI pertain to establishment matters of the period such as appointment of persons, their leave, provident fund, retirement etc. which ought to have been weeded out long ago. Policy files, Intelligence Bureau (IB) records and Cabinet papers are not available though nearly six decades have elapsed since independence. Certain files have only the noting portion and no correspondence section at all. From the beginning of 1947, Monthly Summaries of important events sent to the Cabinet are not available for perusal. 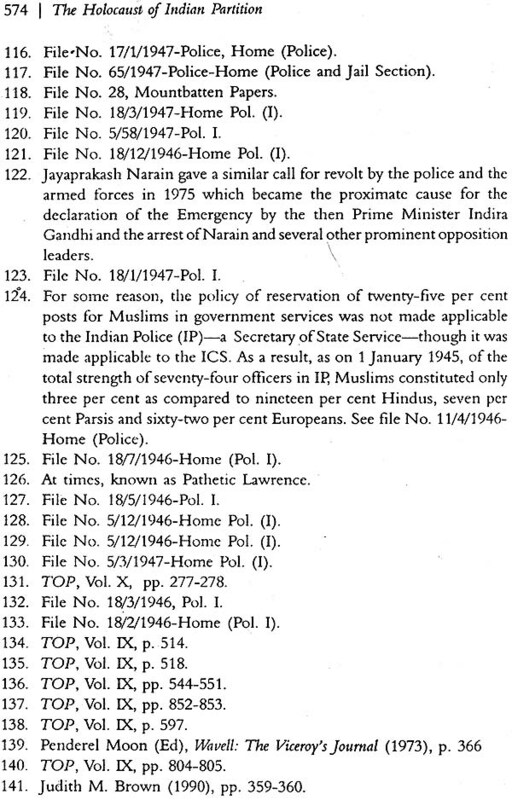 These summaries as also the Cabinet notes seem to have been removed by MHA before sending the files to the Archives.? In so far as the Ministry of Railways, which played such a crucial role in transporting refugees, is concerned, practically no worthwhile record of the period has been transferred to NAI. The same is true of the Ministry of rehabilitation which was set up in September 1947 and dealt with all matters pertaining to the refugee relief, rehabilitation and resettlement. So far as the Cabinet Secretariat is concerned, the list of files pertaining to partition and related matters for the years 1946- 48 which had been "reviewed, downgraded and transferred" to NAI were just three and these too were quite inconsequential. No files pertaining to 1949 have been transferred to NAI at all. Several files in NAI are in such deplorable condition-with torn, tattered and brittle papers, faded writing and so on-that it is doubtful how long researchers will be able to use them in any meaningful way.